Travel to Kathmandu where we’ll be met by an amazing blend of cultures, religions and people. Today will give you the chance to check in to your luxury accommodation, relax post flight and prepare for the trek. In the evening you will receive a comprehensive brief from your Expedition Leader on the adventure you are about to undertake. The day starts with an early morning flight into Lukla (2,800m), from where we’ll begin the trek into the Khumbu region. The views from the airplane are amazing, providing dramatic scenes of terraced hills and the distant Himalayan giants, as the plane flies beneath the summits of nearby mountains. After landing on one of the world’s most exhilarating runways we’ll meet the rest of our local team and we will begin a three to four hour trek to Monju (2,835m), where we’ll spend the night. The trek continues along the banks of the Dudh Kosi. Crossing this roaring river on suspension bridges laden with prayer flags is bound to be a thrilling experience. After entering Sagamartha National Park, the trail climbs steeply with breathtaking views to Namche Bazaar (3,400m), the gateway to the Khumbu region and the lively trading post of the valley. Today is a rest and acclimatisation day. Namche is the Sherpa capital and a bustling village filled with markets and traditional Sherpa houses. There’s an optional morning hike to the Sherpa museum from where we can view Mt. Everest, Lhotse (the 4th highest peak in the world- 8,516 m) and the beautiful Ama Dablam (6,812m). The Sherpa Museum houses an exhibit on traditional Sherpa lifestyles and a fabulous photography display. The rest of the day can be spent at leisure. From Namche Bazaar, we will trek along the contour of the hills, looking down onto the deep and lush valleys below. 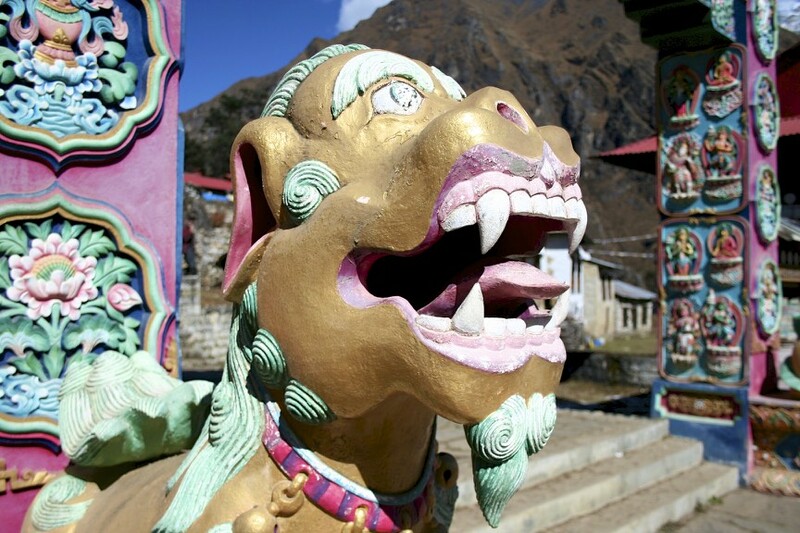 The route travels through Thyangboche, the spiritual centre of the Khumbu. At Thyangboche there is a famous monastery, which is home to incredibly ornate wall hangings, a giant sculpture of Buddha, and the musical instruments and robes of the Lamas. Some time can be spent here before the trek continues downhill into rhododendron forests, culminating in Deboche (3,800m) where a secluded camp awaits our arrival. We are now above 4,000m so this is a valuable rest and acclimatisation day to allow climbers to adjust to the rarefied atmosphere. There is the option of a light hike up the valley to take a few more photographs of the spectacular 6,000m peaks of Tawoche, Cholatse, Island Peak and the 8,000m wall of Lhotse. On a clear day we may see Mount Makulu, another giant standing above 8,000m and the 5th highest mountain in the world. Today’s activities can be variable and flexible to suit you. Today, we’ll make our way further up the valley to Pheriche. Take a gentle hike through the valley or visit the Himalayan Association Medical Clinic in Pheriche. From Dingboche, the trail traverses through farmlands and meadows. Stop in Dzugla (4,570m) for lunch before continuing along the lateral moraine of the Khumbu Glacier. En route we’ll pass stone memorials to climbers who have died on the mountains- look carefully and you’ll find touching memorials to famous mountaineers. The trail concludes at Lobuche (4,900m) with camp set up just below the terminal moraine of the tributary glacier. An early morning start winds through the terminal moraine of the Khumbu glacier to a camp at Gorak Shep (5,410m), situated at the base of Kala Patthar. This was the original Base Camp used by Sir Edmund Hillary and Tenzing Norgay on their successful ascent of Everest, before the Base Camp moved closer to the mountain on the edge of the Khumbu Icefall. From Gorak Shep, ascend the non-technical Kala Patthar (5,550m) and admire the incredible views. From here we can clearly see the summit of Mount Everest, Nuptse, Lhotse and Ama Dablam. Here’s the unforgettable chance to watch the sun set slowly onto Everest. This is the classical shot so often used for iconic pictures of Everest and highlights the beauty of nature at its best. Journey to the Base Camp of Mount Everest (5,550m), as used by today’s best mountaineers, located at the foot of the Khumbu icefall. This can be a strenuous day but the satisfaction of having achieved our objective, and conquering a significant part of Mount Everest will make it all worthwhile. On arrival at Everest Base Camp, we will have the chance to explore this historic area in detail. Drop back down to Gorek Shep (5,165m) today as we begin our descent. Follow the route back down the Khumbu valley to Pangboche (3,850m). Arrive back in Lukla (2,800m) where we can relax and unwind. We’ll be able to enjoy the local culture of the village, which offers many shops, restaurants and teahouses. Return to Kathmandu and check into the luxury hotel located in the heart of the city. You will be able to use the rest of the trip to relax and explore the area. Kathmandu offers the chance to visit Durbar Square, designated a UNESCO World Heritage Site in 1979. The square holds the palaces of the Malla and Shah kings who once ruled over the city. Along with these palaces, the square holds courtyards of temples that boast fantastic architecture. Surrounding the square are bustling markets where you will be able to find a whole range of Nepalese goods from clothing, jewelry to cultural handicrafts. This is a wonderful place to get a real feel for the city. You will also have the option to visit one of the holy places of Hinduism, The Temple of Pashupatinath. This is situated north of Kathmandu, next to the Baghmati River, and is renowned for where the Hindu ritual of cremation washing takes place. Many relatives who join the funeral procession take a bath in the Bagmati River, which is thought to purify the people spiritually. **Please note that there may be weather dependent delays to internal flights to and from Lukla. In the case of significant delays, international flights departing from Kathmandu may be missed. Should you wish to consider extending your itinerary in Kathmandu to mitigate these circumstances, please discuss with the team prior to your trip. We will ensure that all suitable accommodation and meals will be provided. However, rescheduled international flights will be at your own expense. From £7,090 per person based on two people sharing (£880 single supplement), this includes international flights with Qatar Airways from London Heathrow (flights from alternative airports worldwide possible), an Expedition Leader from ‘The Adventure Boutique’, local guides, porters, accommodation, scheduled meals, park fees, tips for the local staff and porters, local chefs and local transportation. A non-refundable deposit of £1,250pp will be required. We’re not kitting you out with ropes and crampons so no technical climbing skills are needed, but we are going quite high, with several uphill and downhill trails passing through Sherpa villages en route. However, the high-end camping provided allows you to focus on climbing the mountain rather than worrying about whether your tent will be wet in the morning. Our proven in- depth knowledge and expertise with expedition logistics and equipment gives you the attention to detail and edge over other Everest Base Camp ascents. This allows you to solely concentrate on the climb and enjoy the stunning surroundings. We will specially be bringing ‘Portaloos’ for you all the way up the mountain to each of our campsites. This is to offer you the comforts that are missed by others on mountain treks ensuring you are made to feel as happy as possible. You say we’re going high - do I need to acclimatise? The climate during your trip will vary between warm in Kathmandu (20° - 30°C), to relatively warm on the lower trekking trails (15° - 25° daytime) to cold at the higher elevations (0° - 5° daytime). Night time temperatures at Gorak Shep and Base Camp can drop below freezing. The majority of the days should be dry with little rain. Yes, the porters are there to make life as easy as possible for you without detracting from the challenge of trekking to the base camp of the highest mountain in the world. Every ounce of weight becomes magnified at altitude, so we want you to save as much energy as possible to successfully reach base camp. All you need to carry is a light daypack, containing essentials described in the daypack kit list that will be provided. Even if you don’t want to carry this, we can organise a local guide to personally carry it for you. You do not need to tip the local staff. Unlike other companies, we have included the tipping into the price so there are no hidden surprises when you arrive in the country. Tipping the Expedition Leader is at your discretion but will be much appreciated, especially after you witness their dedication and professionalism in looking after you and helping you to the base camp. You should not need specialist-climbing insurance, but check with your insurer that you are covered trekking to the altitude you will be reaching (5,550m). If you do not have adequate insurance cover, The Adventure Boutique team can refer you to appropriate insurers. This is dependent on your nationality, The Adventure Boutique team can advise you on this upon signing up. British citizens can obtain, in advance, from the Nepalese Embassy in London or on arrival in Nepal. What is the minimum age a person has to be to go on this expedition? You may find some mobile phone reception during the trek, but don't be surprised if your phone does not work. We specially carry a satellite phone in case of emergencies, but we also realise people may need to keep in touch with their loved ones or have some work commitments to deal with. The satellite phone can be used for a charge.